when updating the kernel from 4.15.0-43 to 4.15.0-45, a fatal error occurs when logging in to the text console (multi-user target, Runlevel 3). After entering the login name (eg root) plus enter key, the cursor immediately moves on from the input prompt for the password, i. it sent an empty password for login. This is wrong and not correct. The bug also occurs with kernel 4.18.0-14, which I have installed as a trial, affecting at least two kernel versions of it 4.15.0-45 and 4.18.0-14. The error does not occur if you want to log in as root after starting the KDE desktop with the console. So the last working kernel is 4.15.0-42. The error does not occur if you want to log in as root after starting the KDE desktop with the console. Is the error already known neon or is there a bug report about it? 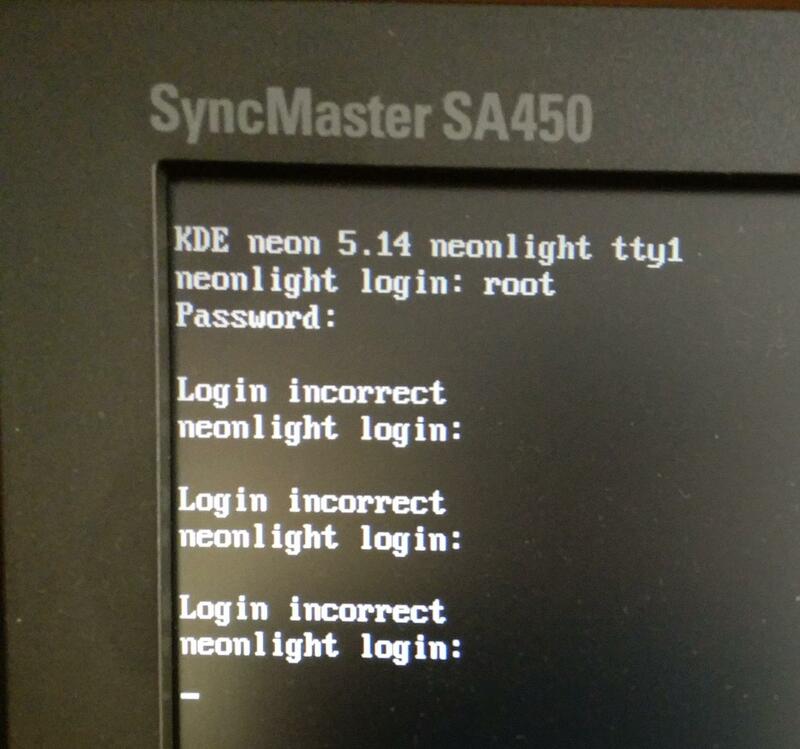 What can you do that the login with the above mentioned kernel versions in the text console works again? "bash", then You didn't reach "multi-user.target". In the "Grub" I temporarily entered the multi-user target (systemd.unit = multi-user.target) at the end of the line where the corresponding Linux kernel is entered. I can not log in on the text console, because no password input is possible (see screenshot). As I said I can not log in, neither as root nor as a user in the text console (tty). The output of the command I created in the KDE console as root. Whatever that may mean. Don't want to be tracked. the cursor immediately moves on from the input prompt for the password, i. it sent an empty password for login. Where does the text-cursor move to? Asking for account-name, again? Something else? Is there some output in the logs ("journalctl -b")? pressing ENTER once or twice? The cursor moves to enter the password, but jumps immediately. The error message "Login incorrect" appears four times. Then the erroneous login messages are cleared on the screen and it starts all over again. Here the output from journalctl. Feb 03 12:47:33 neonlight systemd: getty@tty2.service: Service has no hold-off time, scheduling restart. Feb 03 12:47:33 neonlight systemd: getty@tty2.service: Scheduled restart job, restart counter is at 4. Feb 03 12:47:33 neonlight systemd: Stopped Getty on tty2. Feb 03 12:47:33 neonlight systemd: Started Getty on tty2. It does not matter if I try something or nothing at all. The result is always the same "Login incorrect". The input cursor jumps immediately without waiting for my input. configured to not be able to be used for login. because <only the Gods know> or <not even the Gods know>. no there is no exclamation mark on the root account. It is neither a login with root nor with a user possible (both with the same error). Last edited by NoNameNoBlame on Sun Feb 03, 2019 1:14 pm, edited 1 time in total. before rebooting, test it by logging in!!! Use "su"-command. Afterwards: "journalctl -b", again. Else: If typo, then worse than before. error message "Login incorrect" appears four times. systemd: getty@tty2.service: Scheduled restart job, restart counter is at 4. Both "4 times": Coincidence? Hardly. This is probably a known bug in the kernel. We have to wait for Ubuntu-Fix. I can confirm I'm getting the same issue. Logging in with Plasma's user interface is working just fine. However, whenever I switch to another terminal-only screens (Ctrl+Alt+F2 and so on), after pressing ENTER after typing in my username in the username prompt, it will somehow keep on sending more ENTER to the input on a loop, so I can't type in my password since it will forcefully submit the empty password prompt. After it fails to login, it will of course show another login prompt to try again, but this time I won't even be able to input my username since it will forcefully submit the empty username prompt. And as we know it, empty username will fail too. So yeah, it will keep on doing that until the maximum 4 tries, after which the screen will just "reset", and I will end up with the same issue all over again if I try to login. EDIT: Someone mentioned being unwilling to view the screenshot from one of the previous replies. Pretty much the same thing I'm seeing. EDIT 2: Trying to login as root or not appears to be irrelevant, as I'm getting the issue when trying to login to my own non-root account.